When the real estate market favors home buyers, the commercial real estate market also tends to favor lessees (those who lease or rent space). When home prices are down, it is a strong indicator that you can also find cheaper commercial spaces than when home prices are strong. Click on your state, then county, then type of classified you are looking for. One of the benefits of finding properties on Craigslist is that many listings are posted by individuals. If a landlord can lease or sublease space without using a realtor they save money - savings that they may be willing to pass along to you. A nationwide commercial real estate listing service online. This is a better resource for finding commercial properties for sale, but the site also lists spaces for lease. Search by state, city, or zip code. You can look in your local paper for listings by realtors but pay close attention to listings posted by individuals. Landlords who can rent their space without using a realtor save by not having to pay a commission. Be sure to try and use that knowledge to your financial advantage. If you are looking for non-industrial space just substitute the word "industrial" for "commercial" and the "retail" or "office" instead of "industrial." "city-state industrial space for lease,"
"city-state lease industrial retail space". It is hard to be patient, but the most important thing to remember when looking for commercial real estate is to take your time. Look at a variety of spaces and compare prices. Ask family and friends if they know of spaces for lease. 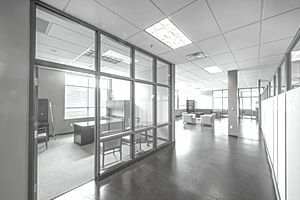 If you only need a small amount of space, ask local churches, community centers, and even other businesses if they have a spare office to rent. Your local chamber of commerce may also be able to help you find local resources. Look for spaces that offer one- to two-year leases and ask for renewal options. While many landlords will push for long-term leases, especially when times are hard, leases beyond two years rarely serve the best interest of a tenant. In tough economic times, you have an advantage, but you can quickly lose that advantage by being impulsive.